I want to thank each and everyone of you for the sweet comments you left on my buffet transformation. I am constantly in awe at the support and kindness you show me. I’m not always able to thank you personally but I do want you to know how very much this means to me. 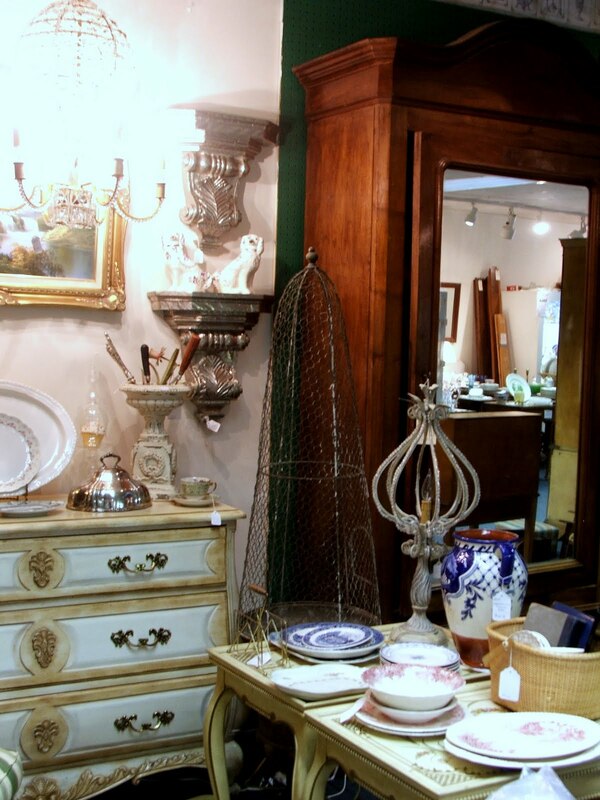 Some of you know that I am an antique dealer and have had the brick and mortar shops in the past. Prior to moving to Virginia I rented large spaces in five different antique malls, including three in Destin, Fl. Because Destin is a beach town the shabby chic, beachy, painted furniture was what I sold the best. Richmond is very traditional and I had to re-think the type of furniture that would sell best here. I do manage to throw a shabby piece in every once and a while though! quality of the pictures. There are so many chandeliers and fluorescent lights that photos are a challenge. 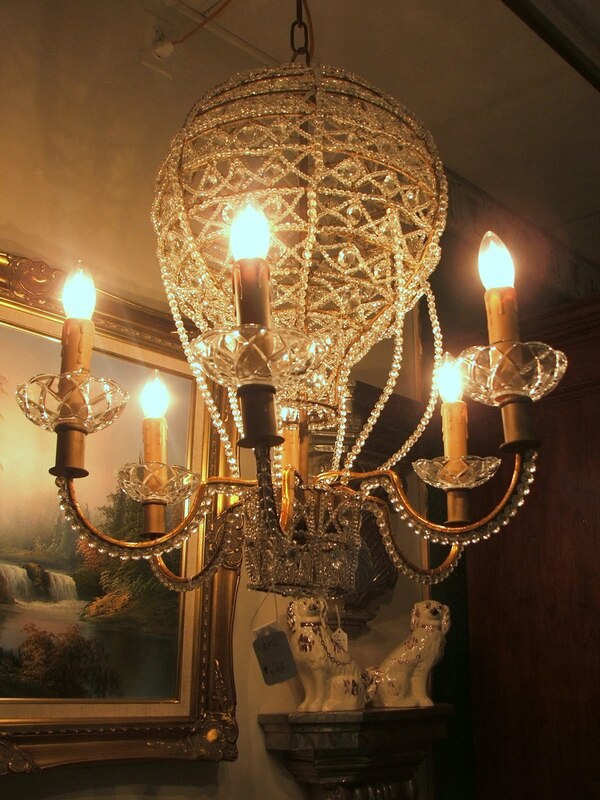 This vintage crystal chandelier is shaped like a hot air balloon. You can not imagine how hard it was not to keep this one myself! The sconces are wood and wrapped in metal. stop by West End Antique Mall. 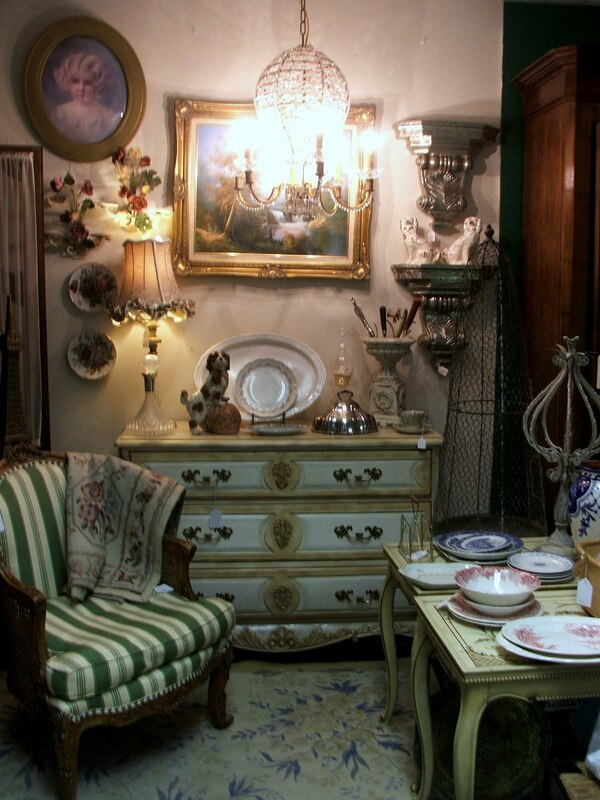 I would love for you to share your favorite place to shop for antiques. Sherry your booth is just beautiful and filled with so many wonderful things! My brother is a hot air balloon pilot, so the chandelier caught my eye right away! My sister lives in Richmond so I exactly what you mean about it being a more traditional city! I hope to get down and see your beautiful wares in person one day! THANKS FOR SHARING YOUR AMAZING BOOTH WITH US :)SO LOOKING FORWARD TO SEEING MORE!!! Oh, Sherry, how I wished I was close by. Look at at all those wonderful goodies. I would need to take out a loan just to buy all your stuff. 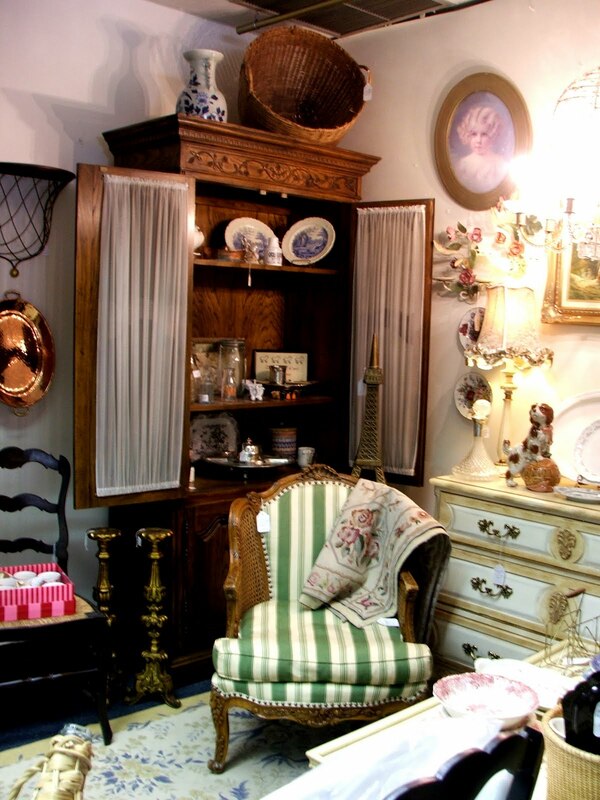 Love the chandy and look at that beautiful hutch. My dad and step mom have lived in Destin several years now. They were realtors there. 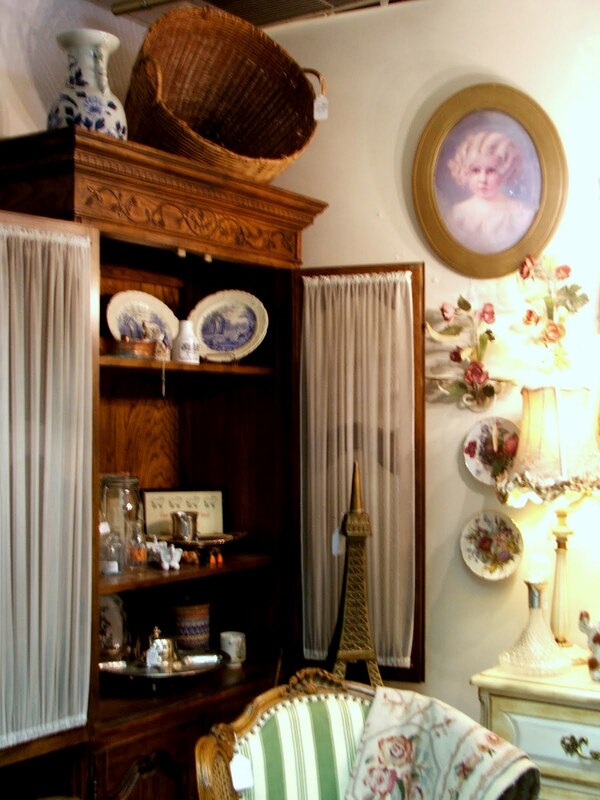 beautiful setup in your booth with the lovely antiques! i was wondering…in the center of your banner/header is stoneware with letters/words…are these reproductions or antiques? 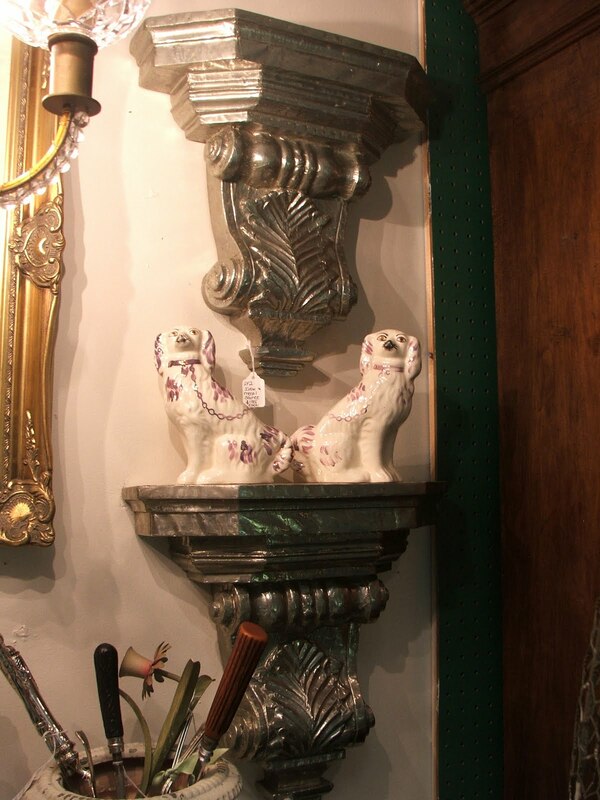 if reproductions…where did you find them…love that look. SOOOOOO not fair that I can't come shopping there! That painted dresser was meant for my house! 🙂 I love all that you do and once again appreciate your "no minimalist" approach to decorating! I'm hosting an Inspiration Friday party and would love to have you join us! Wow! I love everything in your shop! Especially that green striped chair. It is beautiful! Ohh my…I see sooo many things that I would love to have! I love that beautiful white and gold chest of drawers! My friend, that chandelier is fabulous!!! Oh my, I'm afraid I would have had to keep it! It's truly unique…I don't believe that I have ever seen one in the shape of a hot air balloon! Gorgeous!!! Thank you so much for giving us a little peek of one of your shops…it's really beautiful, Sherry! Wished I lived closer! wink! Love your buffet you painted, looks beautiful! 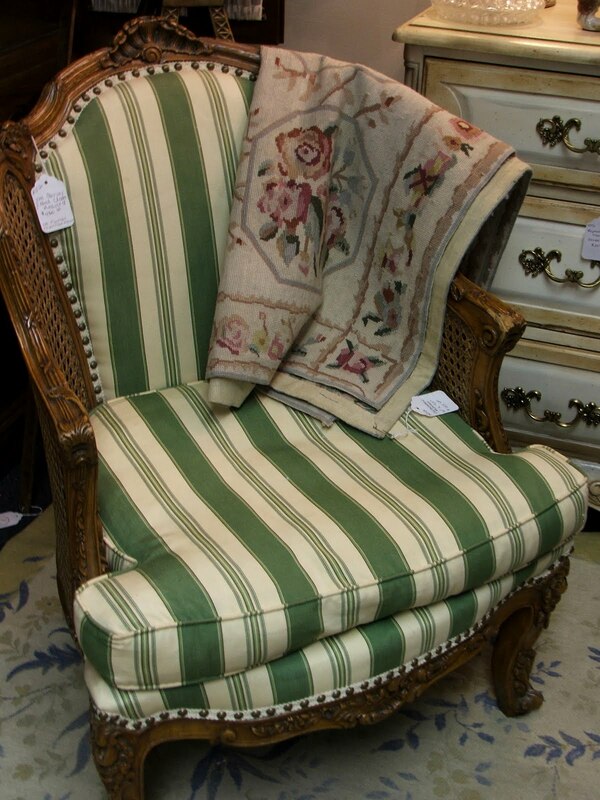 I too love the green striped chair. This booth is just my style. LOVE LOVE LOVE IT! Sherry!! Your booth is awesome!! So many beautiful things to look at. Your booth is so lovely. You have exquisite taste. Everything is so elegant and fit for a palace. I know what you mean about different areas loving different things. We are a beach community so the shabby, cottagey painted furniture is the big thing. Looks as though you have really captured the style of the Richmond area. Oh I love it!!! Sherry the space is gorgeous! I love going to antique malls and (spending my coin) seeing all the great stuff. But I especially loved seeing your great stuff. You have such an eye, and I imagine that you stay ahead of the trends to know what to buy next. I loved your buffet redo. It turned out so lovely! Everything is so gorgeous! I would love to shop there. Sherry your space is gorgeous! Love that chandelier! Your displays are lovely; I’ll take one of everything! That cute hot air balloon chandelier is indeed a keeper. Thank you for stopping by my blog and sharing the good news about Heather. Everyone’s prayers and well wishes helps boost my spirits. I’m looking forward to getting back to regular blogging one day soon. I see some soup tureens that are calling my name… buy me buy me!! Wonderful displays! wonderful eye candy!!! Thank you so much for sharing the pictures with us! Oh My! Sherry, your booth is gorgeous! I love that hot air balloon Chandelier…I'm like you, I think that would be very hard to part with. You have very unique and beautiful items. Love them all! My hubby is so glad we do not live in VA! Simply gorgeous! Thanks for showing us your booth…you have it filled with such beautiful pieces. Were you located at Smith's in Destin? If so, I might have purchased some pieces from you…I love that shop! What a fun post this was….and I so wish I was able to shop at this mall….how fun! I loved that chair, so cute. Have a great VTT! I love antiques and you have some nice ones! Hi Sherry, The West End Mall is so nice. I love the photos of what you shared today. I just spent 4 days with my sister on a buying trip for her Antique business. endless malls and two big shows. However, we were not in your area. Sigh. Your space is stunning, wow! That is a beautiful booth I would say. That little dresser is great and I want it. Everything in the booth is a I want. Oh I love that silver dome cover. Oh I want the stafforshire dogs also. There goes my allowance for the year. So if I want to purchase something in the photos how do I convince you to ship it to me? LOL! Beautiful items!! Hi Sherry, this is a wonderful space, and love the traditional feel. And yes, the chandy is fabulous, thanks sooo much for linking up with VIF. I ALWAYS love your creative posts! This booth is sooo well displayed and beautiful. I love how you show off each and every item for sale, but, still they compliment each other placed together. Sooo much eye candy I think I'm getting a tooth ache….lol. How ever did you bring yourself to put your chandy up for sale? It is beautiful. Thank you Decgal.